Getting your staff from various pickup points and bring them to work and returning them afterwards, either on a day to day basis or shift work. We can cover around the clock, 7 days a week, 52 weeks of the year to suit you. We offer competitive prices that do not go up during the contracted period, even if the days or nights are Bank Holidays, Sundays or unsociable hours. If your staff needs to be in at i.e. 4.00am Christmas Day during the contracted period, then we will deliver them at the same cost as any other day. With a fixed price from 1 month to 12, it can be very reassuring to companies to know they are not going to suddenly meet any hidden charges. Taking clients to on-site factory and site tours or visits to off-site projects. Bringing customers to your workplace. You want a Company you can trust, with smartly dressed, professional drivers that will look after you. Shuttling passengers around from car parks. You want a Company that cares as much about your image as we do because first impressions count. 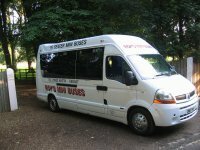 Make it count for you with Roy's Minibuses. 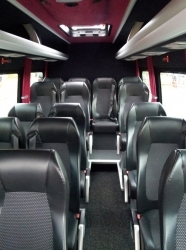 Taking colleagues out for the day/evening to The Races, Theatre or for a meal, we have the right kind of minibuses for you, with individual reading lights and blown air. Subtle neon lighting, tables and full drawn curtains. Luggage racks and enough boot space to accommodate you all. Off to the Grand Prix, out for a day's Cricket, Rugby or any kind of Staff, Management event, we will deliver you there and back safely. You want your passengers or customers collecting in style. We do feeder work for some of the biggest coach companies in the UK. They use us for a reason. 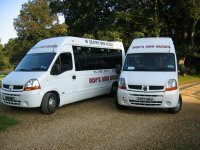 Why not give us a try and find out what makes them keep coming back to Roy's Minibuses? You will soon see what.